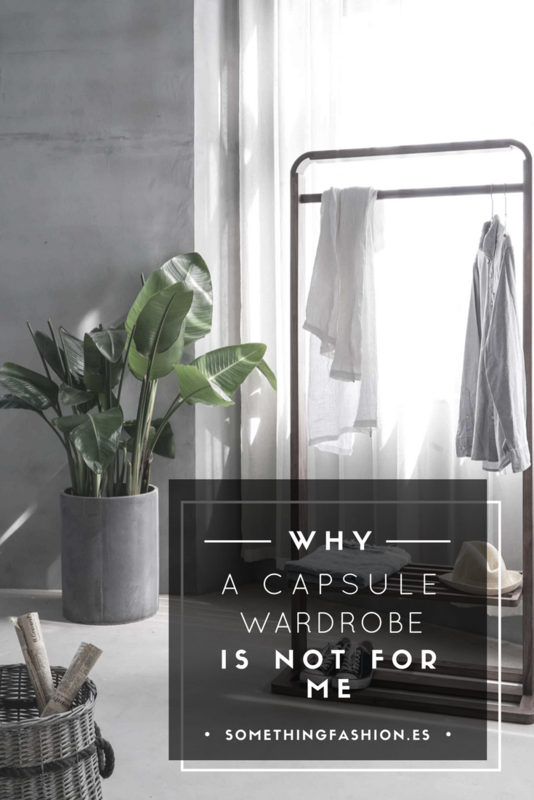 Why a capsule wardrobe is not for me - Is it for you? Every time I go on Youtube, it doesn't matter if I'm watching makeup-related videos, clips of my favorite series or films or anything random: I will always get suggested capsule-wardrobe related videos by fellow YouTubers and videobloggers. As many of you would already know, a capsule wardrobe is one where you have -very- limited pieces which are supposed to coordinate between them to achieve tons of looks with minimum clothing garments. This idea is amazing to achieve a clutter-free wardrobe, to stop spending money and effort shopping in clothes that you don't really need and basically, it's supposed to be all the good in the entire World. But, I must confess that the idea of narrowing my closet to about 30 pieces scares the hell out of me. Although I keep the capsule wardrobe philosophy in mind every time I got on a trip to maximize my suitcase and avoid traveling with way too much stuff, I considered it necessary to tell you in this post why it would be absolutely impossible for me to reduce my daily wardrobe to only 30 pieces. I am a strong advocate that having an organized and clean closet, with a wide variety of clothes and with a more or less defined style is essential to be able to dress appropriately depending on the occasion. I must confess, that, like Leandra Medine, better known as TheManRepeller said in an interview on her blog, there are days when I get up and do not know what to wear. There are days when I would also like my closet to have only 15-20 pieces of clothing. But it's not like that. I like fashion. Very much. If I did not like fashion, talk about it and experience it in the first person, I would not have a blog dedicated to fashion. My closet is something that, despite being still very young, I have been building since I entered teenagehood, and reducing it to a capsule wardrobe is something that would undermine my principles. Throw/donate/sell all my clothes to build from scratch a new cohesive wardrobe where all the clothes combine with each other? It does not make any sense to me. Therefore, I do try to make a small weekly organization in my head in which I form a kind of "weekly capsule wardrobe" in order to reuse some clothes before throwing them in the washing machine, or having no need to keep and remove from the confines of my closet different coats every single day. Because of this, an integral capsule wardrobe is not for me. It is true that lately (and even more since I am living in Italy) I try to buy less things. In fact, what little I buy is vintage, or from small brands. I'm trying very hard not to go crazy every time there are discounts in some big chains like Zara, Mango or H&M and from there I try only to buy the basics I need every season every time a shirt or pair of pants ends its life cycle due to the massive use I give them (this Winter I have used many sweaters that have made fuzz pills very soon, in addition to several basic shirts that have lost their shape when ironed. What a pity!). That's why, the sustainability issue for me is important, but I could not remedy it either by having a capsule wardrobe. Acquiring few old, vintage or pre-loved pieces is my way of facing sustainable consumption. A capsule Wardrobe isn´t for me either. I tend to switch my style depending on my mood, so it would be impossible for me to have a cohesive-limited piece of clothes. I applause people who can actually do it and don't lose their sense of fashion.